In honor of world mental health day, it’s time to address mental health. Especially in recovery, we can get caught up in the idea of “as long as I don’t get high or drink, I’m okay.” That couldn’t be further from the truth while remaining sober is how we can improve our mental health, but our mental health is just as important as our sobriety. There are ways to take care of our mental health and our sobriety simultaneously, but there are also some areas where we can solely focus on our mental health outside of a 12-step recovery program. We suffer from a 3-fold disease; it is a mental, physical and spiritual malady. How can we address our mental health on a day-to-day basis? What is Your Mental Health? – Biological factors, such as brain chemistry or genetics. – Life experiences like trauma or abuse. – Family history of mental health problems, some mental health disorders are passed on through genetics. If you have a combination of these factors, there is a greater chance that you can have problems with mental health, that doesn’t mean that there is anything wrong with you. Mental health diagnoses running in your family doesn’t guarantee that you will develop a mental health problem. Mental health is the same as physical health, if you have a sprained ankle you treat it. It is the same approach to mental health care. If you’re unsure that you may be struggling with a mental health problem, there are early warning signs. Pulling away from people or usual activities, it could be a sign of depression. While not all of these are signs of a mental health problem, they could be. It’s better to pay attention to the signs that our body and mind are giving us than to ignore the possible signs. In recovery, it’s especially important to pay attention to our mental health because it could be a sign of relapse. When it comes to tackling mental health, it can seem like an overwhelming task. Just as we have to take our recovery one day at a time, we must do the same with our mental health. There are easy ways to take care of your mental health on a daily basis, and techniques that you can implement into your everyday life to improve your mental health. Talk about your feelings – Whether you share in a meeting, talk to your sponsor, to sober supports, or your therapist in treatment, it’s important to talk about your feelings. When we isolate ourselves and don’t get honest with how we feel it can lead to larger problems, like a relapse or acting out in negative ways. There is no reason to feel ashamed of your feelings. While it may not be easy to put how you’re feeling into words, give yourself time and it will become easier. By talking through your feelings with someone, you can get feedback or just get your feelings off your chest which is helpful. If at first, it feels strange talking about your feelings, keep practicing and talking about them will become more natural. Keep active– This doesn’t mean you have to be a marathon runner or a triathlete. Keeping active and exercising are some of the easiest ways to help cope with mental health. Staying active isn’t always going to the gym, you can keep yourself active by going for a walk or doing housework like cleaning or yard work. Keeping yourself active can help fight depression, boost concentration, and staying active is a natural mood booster. Exercise can also be used as a chance to employ mindful practices, which are proven to help you feel more satisfied with your workout. Ask for help – If you are struggling whether it be emotionally or mentally, ask for help. Asking for help doesn’t make you weak, or incapable of handling life, everyone needs help at some point. Although there is still a large stigma associated with mental health, there is help available. You can reach out to people in meetings, sober supports or if you feel that you need professional help, consult a therapist or counselor. Sometimes we have to step out of our comfort zone to grow healthy. Take a break– We all need some ‘me-time,’ it is not selfish, it is healthy. In recovery, especially early recovery, it can be scary to sit with yourself without being intoxicated. That takes time and growth to be able to be comfortable to be with yourself. Self-care is important. If you have to take a 5-minute break while you’re cleaning, do it it’s okay to take breaks when needed. There’s no need to overwhelm yourself doing everyday things. Me-time doesn’t mean the same thing for everyone, me-time for you might not be curling up with a book but going for a walk or visiting a new place. You get to decide what your me-time is and what works for you. Create a schedule – Whether you create a bedtime ritual, a morning routine, or a daily schedule, having a schedule can help to relieve stress. When you have a schedule, it gives you enough time to get done what you need to in the day. Create a schedule that works for your mental health needs, and everyday tasks. When you make a schedule, remember that life does show up. You may not be able to stick to your schedule every day, and that is okay. You can get back on track after a disruption to your routine, without beating yourself up over it. Start today. There is no better time to start taking care of your mental health than now. When you start looking at taking care of yourself with a deadline or a start date, it tends to get overwhelming. Remember to start small, take your mental health one step at a time, just as we do with our recovery. We can’t tackle all our problems and concerns in one day or one therapy session, but it’s imperative to start today. The sooner you start, the sooner you begin to feel better. Taking care of your mental health isn’t a one-time deal, just as getting sober isn’t going to treatment and being “cured.” Treating your mental health is a lifelong task, but it’s one that you don’t have to do alone. If you or a loved one are struggling with mental health problems or substance abuse due to mental health, call us today at 855-448-3638. 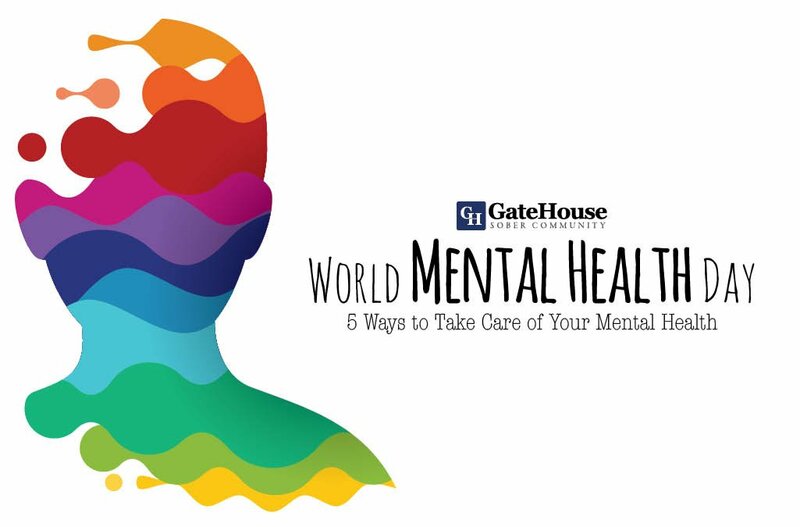 GateHouse Sober Community can help you tackle your mental health problems and substance use disorders. You’re not alone, reach out today.